Notre Dame’s College of Foreign and Domestic Commerce was founded in 1921. In the early 2000’s the college was re-named the Mendoza College of Business to honor a $35 million donation from Tom (ND ’73) and Kathy Mendoza. The two-year and one-year MBA’s classes take place on Notre Dame’s South Bend, Indiana campus. In addition, the 18-month EMBA takes place on Mendoza’s campus in downtown Chicago. 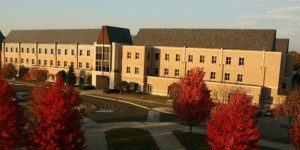 The Mendoza College of Business in Indiana is comprised of four buildings and includes an auditorium, conference center, and entrepreneurial digital research facilities. The MBA faculty includes approximately 182 instructors, including professors, associate professors, and adjunct instructors. Furthermore, prominent business leaders occasionally serve as visiting lecturers to give students an insider’s view of the business world. The most recent Mendoza class featured a total enrollment of over 1,800 students, including more than 300 MBA students. Mendoza offers two-year, one-year, and Executive MBA programs. As well, the school offers multiple dual MBA degrees, including a MBA/MSBA, MBA/JD (three or four-year options), MBA/Bachelor of Science, and an MBA/Bachelor of Science in Engineering.